Teams must allocate one member to each of the following movements. With a running clock and moving through each in the listed order, teams accumulate as much load moved on each in 6 minutes per movement. One bar (20kg) is to be shared by team. It is the teams responsibility to change weights between athletes as required. Prior to starting the event teams must nominate athletes for movements and weights to be done. Once nominated these can’t be changed. Teams cannot start the next movement until the time of 6 minutes per station has been reached. Each event will be scored as an individual event along with the combined weight of all loads. If the weight is under 40kg, a strict no dumping rule will be used. Any dumping of the weight will result in a 3 rep penalty. This also includes after the time change. Part 1 is consists of 5 scoring opportunities. Alternate partners every round. Russian swings must have hands and kettlebell above shoulders at the top of the swing to count. This is scored as 1 event. The remaining 2 partners will have to complete a 10 Minute Row scored by calories. Teams can only pull on the rower when the non-rowing partner has a barbell held overhead. The barbell weight is 80/55kg. Any pull on the handle that starts or finishes when your partner does not have the barbell locked out overhead will cost a 5 calorie penalty off your score. Partners can swap positions as required. In the event the rower is not used for an extended period and goes into power save mode (unlikely). The calorie count will be reset. At the completion of Fran, teams then have the remaining time available to complete as many reps of clean and jerk at 80/55kg as possible. This will be scored as 2 events. Teams will be scored as Fran completion time and for reps of Clean & jerk. Teams will have 2 barbells (20kg for men and 15kg for women). Helpers Rule: The athlete that has finished Fran may help the next athlete complete their Fran reps in a partner format. Only the athlete that “bumped in” the current working athlete can assist. I.e. Athlete 1 finishes Fran and bumps in Athlete 2. Athlete 1 may help complete Fran with Athlete 2. Once Athlete 2 bumps in Athlete 3, Athlete 1 may no longer help but Athlete 2 can then assist Athlete 3. Once Athlete 3 bumps in Athlete 4, only Athlete 3 can assist Athlete 4 in completing Fran. At the completion of Fran, Clean & Jerks can commence straight away after a tag is given by Athlete 4 to whomever teams select to start. Only one athlete can be doing clean and jerk at any time, and hi-5 tags must be given to prior to the next athlete commencing their reps. Note, that in the event a team does not reach the clean & jerk, they will be scored zero points. Teams must complete 1 rep to score on any event. This is scored as a single event. Partners must alternate rounds. Thrusters can only be performed while the bar is lifted. If the bar is dumped at any stage, the KB's must also return to the ground for reset KB's cannot be moved until the bar is up off the ground Teams can use 2 bars if they have a mixed pair. Part 4 - Team Event - "Ricky WOD"
This is scored as 3 events, the muscle up section, the AMRAP section and an overall. On the overall score, each muscle up is awarded 10 points. score will be reps completed by BOTH team members. Teams can choose male/male female/female or male/female to participate. Partner 1 will start first and perform their 5 minute climbing ladder. At the 5 minute mark, partner 2 will take over and start again. If the weight needs changing it is the responsibility of only the working pair to do this. Each team member is to perform 1:30 on the Air Runner for distance. Team scores will be the combined meters made. This will be done to a running clock. The next team member is not allowed to hop on the air runner until the call of go. Teams have a 10 minute time cap to determine their combined CrossFit Football Total. Teams must allocate 1 team member to each movement. There is no "3 attempt" rule for this. Members can have as many efforts as required in the 10 minute allocation. Remaining team members are welcome to assist with weight changes and required to assist with spotting duties. This is scored as a 5 events. 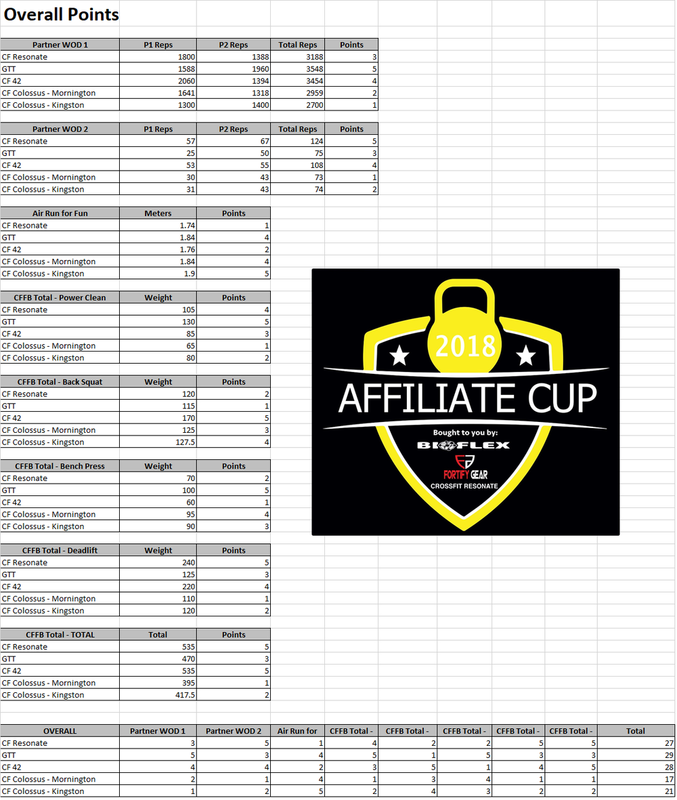 Each movement will be scored as a separate event along with the team total as its own event. The southern athletes have picked up their photo skills a bit better this week! Each team has 12 minutes for each member to establish a 13rm Front squat. Bar taken from racks single bar per team. Collars required. This is scored as 2 separate events. All female athletes will be scored individually and all male athletes the same. Each athlete will be assigned a point score (out of 10 for south and 6 for North reflecting the number of each males and females competing). These points will be added together per team and then used to determine overall placing. This will then be used to form the same 5-4-3-2-1 or 3-2-1 point format. 8 Burpee Box Jump Overs 30/24"
Partners swap each round. Burpees must be facing the boxes. Stepping up is not allowed. The air dyne must be reset each round by the non-working partner only. Female team members to alternate rounds of an increasing EMOM workout. Every 2 minutes 1 rep will be added to each movement. Minute 1, one female does the 5+10+15 then minute 2 the partner will complete the same rep scheme. Providing they both achieve the reps required in under the minute, reps increase to 6+11+16 and continue with both partners performing their respective minute of work again. Once you miss a round or do not complete it in the time cap, your team is out and that is your score including the final round reps. Score will be the reps completed successfully, including the reps in the missed minute. IMPORTANT: Pushups will be peformed with feet, hands and chest on 20kg plates. Hips are not allowed to touch the ground at any point for a repetition to be successful. The pushup rep will be required to start at the top position. This event will require teams to complete DT in partnership. Both males will be required to complete "DT" First. Once they have completed DT, they will tag in the female partners who will then complete DT. Only 1 bar will be given per team. Weights will need to be changed by the team after the male partners have finished their part. Score will be the finished time of the Female pairs. There is a time cap of 15 minutes. In the event a team fails to finish, they will be scored for reps. Safe to say the Northern teams are much better at getting organised for group photos! The rep scheme will be in multiples of 3 for Thrusters and Chest to bar. 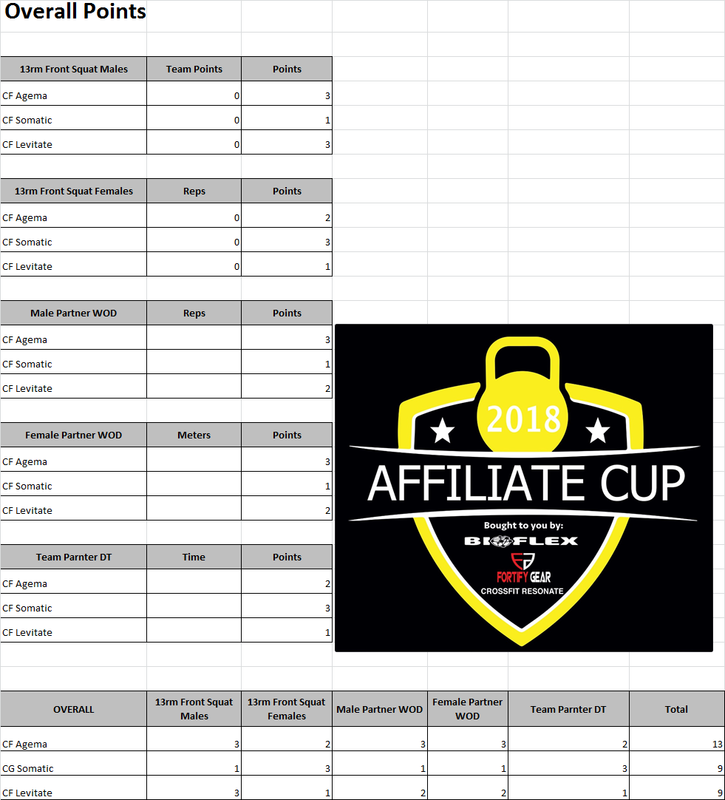 Allocate 1 member from each team to the following Girl workouts. Each girl workout will be completed in a "tag" format. Only 1 barbell and weights will be provided per team. Teams must change the weights as needed. Collars required. Whilst Part 2 is being performed, teams will also have a rower that will be scored for distance at the end of 15 minutes. Team members can swap whenever they need. Burpees (multiples of 3's) and double unders (multiples of 10's). Team members swap each round. Score will be the highest completed round + the reps completed in the next round. You cannot change the team order during the workout. 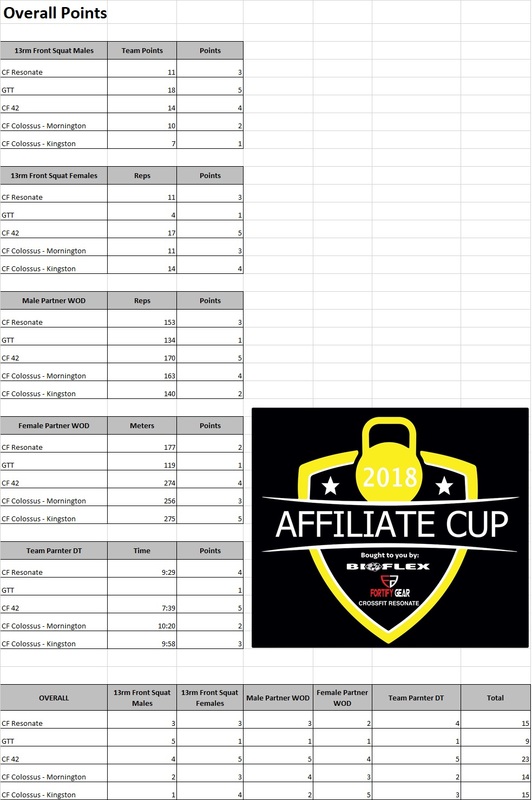 The 2018 Affiliate Cup sees some new teams join us this year. 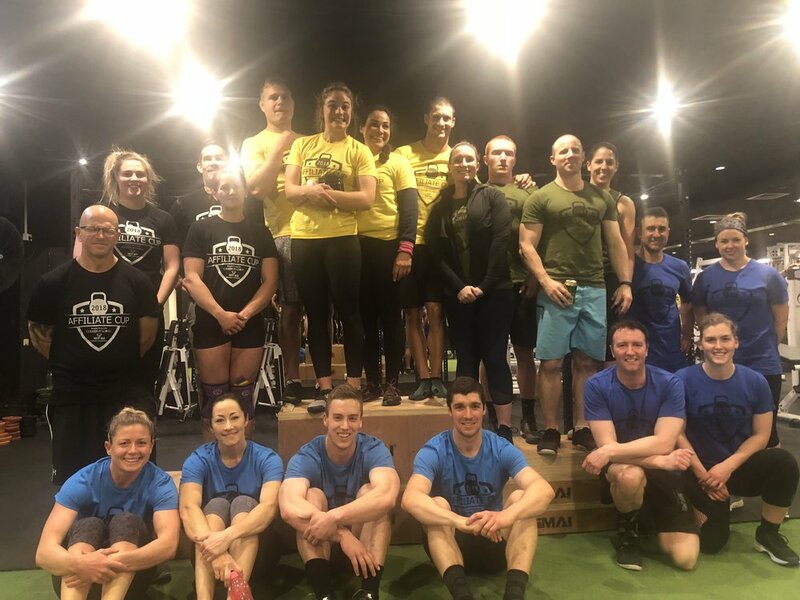 We welcome aboard CrossFit Somatic representing the North West and CrossFit Colossus - Kingston, representing South of Hobart. Good luck guys and girls! Both Northern and Southern Sectionals will take place on Friday nights this year. Northern competitions will start from 6:30pm and Southern from 5:30pm. The top 2 in each region will go onto duke it out at the Festival of Strength on Saturday 3rd November, 2018. Each team must nominate 6 athletes to compete for them over the competition. Each week, 4 athletes get chosen by the teams to compete (2 male 2 female). The event takes place at different gyms each week, giving some teams home advantage. The night will consist of various workouts, some team workouts, some pairs and maybe some individual. Points are awarded based on team placing. After the initial 4 weeks, the teams that are placed 1 & 2 from each region are invited to compete at the Festival of Strength.